Way back in April, I took a course on meditation and pranayama with the ShivaShakti School, I would highly recommend it! It was the 2nd in a series of trainings that I am taking to deepen and expand my practice and teaching of yoga. Since I never did get to share with you about that incredible experience, I wanted to share with you the short essay I wrote for the training about the basics of prana! In the study of esoteric concepts, the student must first suspend disbelief in order to open the mind to the possibility of new levels of awareness. Prana is the energy that connects and exists within all things. Prana is often misinterpreted to mean breath. While the breath can influence the amount or quality of prana, or energy, they are not the same thing. As something that is intangible to most, prana can be a tough concept to fully understand. Think about a time when you had been eating or sleeping poorly and your body felt sluggish. That could be described as having low levels of prana. Now remember a time when you were somewhere beautiful, perhaps in nature. You felt invigorated and full of joy. That could be described as having high levels of prana. Through habits, thoughts, and environment you are constantly influencing your level of prana. Every human, rock, and flower petal contains prana. 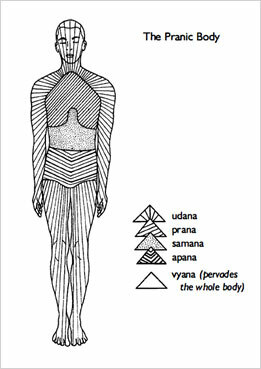 In talking about the prana of humans, we speak in terms of the pranic body. Just as our cells are differentiated into hair cells, muscles cells, bones cells, etc., so too is the pranic body differentiated into unique parts. The koshas, chakras, and the five pranas are all part of the pranic body. The koshas are often referred to as sheaths, or energetic layers that surround the body. I find it helpful to think of them more like layers of experience. Think back to when you were a young child. You had a certain understanding of the world at that time. That understanding changed as you got older. You had different experiences of the world at 4, 8, 12, 16, 20, and so on. The koshas are similar in that they offer different levels of understanding and interaction with the world. Your physical body is the first kosha and is called the annamaya kosha. Moving from the physical body out, you then have the pranamaya kosha (energy layer), the manomaya kosha (mind layer), vijnanamaya kosha (wisdom layer), and finally the anandamaya kosha (bliss layer). Each of these koshas are sustained by prana, our energy, and they offer us levels of understanding of our reality, thoughts, feelings, and behaviors. While the koshas surround the body and offer expanding levels of consciousness and awareness, the chakras rest along the length of the body and are centers of power and energy that fuel the prana. Each chakra is its own small vortex of spinning energy that enlivens certain aspects of the various koshas. You might imagine the chakras as the batteries that power the koshas. There are 7 chakras and energy moves up and down through each of them. Starting from the base of the spine the chakras are mooladhara (root), swadhisthana (sacrum), manipura (solar plexus), anahata (heart), vishudhi (throat), ajna (third-eye), and sahasrara (crown). If you imagine the koshas as the car, and the chakras as the energy supply, then the five pranas are the actual machinery and mechanisms that make the whole thing run. The five are sthoola prana, apana, samana, udana, and vyana. Sthoola prana maintains the thoracic region of the body, heart and lungs. Emotionally and energetically sthoola is related to qualities such as courage, compassion, and focus. Apana sustains the pelvic region, controlling elimination and reproductive organs. It is responsible for qualities such as self control and assists in lifting the energy through the energetic channels of the body. Samana resides in the abdominal area and deals with digestion and some reproductive functions. It is the energy that helps balance the five pranas and keep things working cohesively. Udana controls the extremities and thereby much of the senses and sensory communication between the body and the world. Healthy udana allows for creative expression and enjoyment of life. Vyana encompasses all of the body and the other pranas. It coordinates systems of the body and of the other pranas offering an overall sense of movement, both physical and energetic. When considering how these various components of the energetic body work together, I would suggest that one must endeavor to learn through experience. By tuning into the subtle rhythms and sounds of the body and breath, one can begin to discover for what the ancient yogis learned and passed down. In your self-exploration, you can look to the wisdom of those that have come before you in order to find a greater meaning and context for your personal practice. Keep your eyes peeled for Pranayama & Meditation workshops this coming fall!